They gathered as residents, neighbors and community leaders to discuss the young people who represent the future of our society. 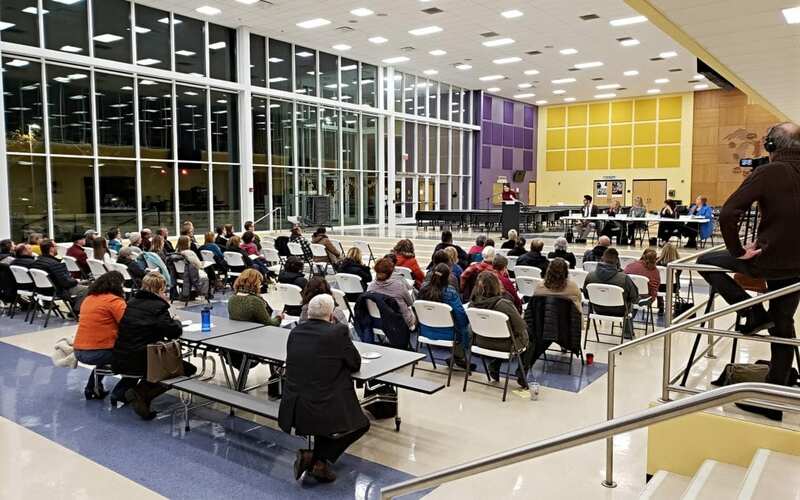 More than 75 attendees ventured to Lakewood High School on Tuesday evening, November 13, to participate in a community forum entitled Depression, Anxiety and Teens – Who Cares? A Community Conversation. Hosted by LakewoodAlive with assistance from Lakewood Public Library, this community forum offered insightful dialogue regarding how we as Lakewoodites can better support our neighbors, both youths and their parents, who are struggling with depression and/or anxiety. After introductory remarks from LakewoodAlive Executive Director Ian Andrews and Lakewood Mayor Michael Summers, moderator Dr. Molly M. Wimbiscus, MD, Child & Adolescent Psychiatrist at Cleveland Clinic, oversaw a discussion covering a variety of topics, including best practices for assisting young people suffering from mental health issues and overcoming the stigma often associated with depression and anxiety. A distinguished panel of experts and leaders participated in this community conversation. Panelists included Nina DeChant (Lakewood City Schools), Dr. Jason V. Lambrese (Cleveland Clinic), Roberta Marcinek (Lakewood City Schools), Colleen McNamara (City of Lakewood – Division of Youth) and Courtney Noster (Healthy Lakewood Foundation). In addressing the panel and the audience, Dr. Wimbiscus referenced the need to empower community members – including parents, teachers and healthcare professionals – to support and encourage our youth through proactively addressing this important societal issue. It’s estimated that one in five adolescents from all walks of life will suffer from depression at some point during their teen years. LakewoodAlive thanks Community Forum Committee volunteers for spearheading the planning process: Toni Gelsomino, Cindy Einhouse, Cindy Friedmann, Jim Hekman, Rachel Kribbs, Cindy Marx, Colleen McNamara, Andrew Morris, Jessica Sloan, Mark Thomas and Chitra Walker.